Media leaders of SCO member countries shared their insights on exchanges and pragmatic cooperation at the first SCO media summit which opened on Friday in Beijing. Huang Kunming, member of the Political Bureau of the Communist Party of China Central Committee and head of the Publicity Department of the CPC Central Committee, reads a congratulatory letter from Chinese President Xi Jinping and delivers a keynote speech at the opening ceremony of the first Shanghai Cooperation Organization media summit in Beijing, capital of China, on June 1, 2018. 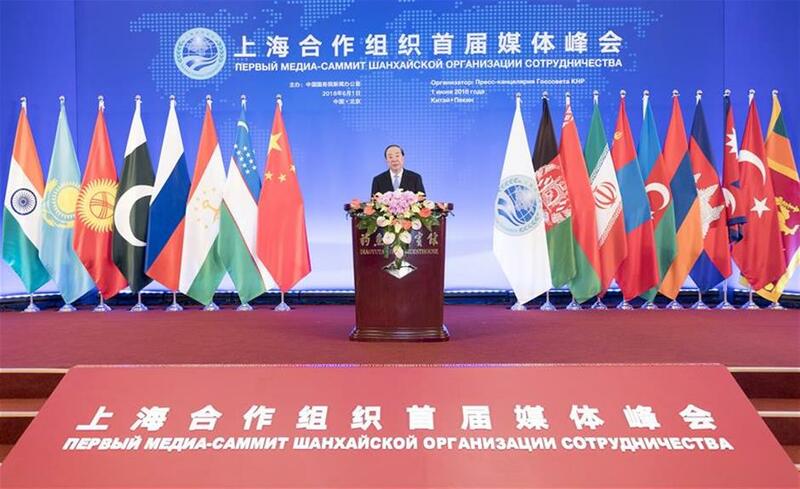 Media leaders of Shanghai Cooperation Organization member countries shared their insights on exchanges and pragmatic cooperation at the first SCO media summit which opened on Friday in Beijing. Huang Kunming, a member of the Political Bureau the Communist Party of China Central Committee and head of the Publicity Department of the CPC Central Committee, delivered a keynote speech at the opening of the summit. With a theme of "carrying on the 'Shanghai Spirit' and ushering a new era for media cooperation," the summit was hosted by the Information Office of the State Council and attracted over 260 attendees, including officials, leaders and representatives of media outlets. While addressing the opening ceremony, SCO Secretary General Rashid Alimov said the summit is conducive to pursuing new cooperation and boosting understanding of changes in SCO member countries. Noting that the world is faced with very complicated, continuous and untraditional threats, Alimov called for joint efforts to build a type of comprehensive, equal, and constructive cooperation. Mauberlinova Nurgul, vice minister of information and communications of Kazakhstan, said that Kazakh media outlets are willing to promote extensive cooperation with their counterparts in SCO member countries, so as to better promote achievements made by their respective countries in social, economic and cultural development. Shafqat Jalil, director-general of the Broadcasting Corporation of Pakistan, said that development of Asian countries has fully proved that they are able to defend their own values while maintaining social and economic development, adding that Asia should make its voice heard through international mainstream media outlets. He said that media can play an active role in promoting harmony and safeguarding peace, security, and stability among SCO member countries, and contribute to building a fair and reasonable international political and economic order via responsible reporting. An initiative on strengthening media exchanges and cooperation was also released at the summit, calling for increased efforts to deepen media cooperation within the SCO framework.